Comprising five films, the ‘Battles’ series was all shot and released within a two year period, unprecedented for such major movies. Perhaps it was the film’s overwhelming commercial success in Japan that drove the series on so quickly. Literally exploding onscreen with a mushroom cloud, and ending with Hiroshima’s A-bomb Dome, the epic story of Battles Without Honor and Humanity follows over 100 characters through twenty years of gang wars, alliances, betrayals, and assassinations, in an exciting exploration of criminal power and politics in Japan. Born in the chaos and lawlessness of the 1945 defeat, the saga is awash in blood and betrayal from the first ad hoc street alliances to seemingly unlimited treachery in the competition for power within the gangs themselves. The clans are organized along business lines, around a credo of duty. A rigid code of honor tasks underlings to make blood oaths to their superiors and remain loyal unto death. The vibrancy and dynamism of the filmmaking, plus its shocking violence, Shakespearean plotlines, and wide tapestry of characters, launched a revolutionary new genre, establishing the series as one of the great masterpieces of world crime cinema. In the opening episode, ex-soldier Shozo Hirono escapes from the post-war black markets to become a key member of the Yamamori gang, but soon finds himself disillusioned by the selfish duplicity of his bosses. Hiroshima Death Match focuses on a demobilized kamikaze pilot drifting through the early 1950’s, whose suicidal impulses find good use as a mob assassin. Proxy War and Police Tactics form a labyrinthine, two-part story of ambition and betrayal set against Japan’s rapid economic growth of the 1960’s, with Shozo caught between warring factions. Final Episode concludes the series in the 1970’s as the former Yamamori gang transforms itself into an economic conglomerate called the Tensei Group, in a bid for mainstream respectability. 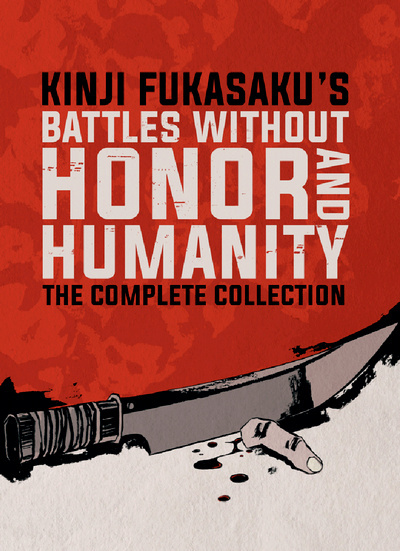 Blu-ray ONE - "Battles Without Honor and Humanity"
Blu-ray TWO - "Hiroshima Death Match"
Blu-ray THREE - "Proxy War"
Blu-ray FOUR - "Police Tactics"
Blu-ray FIVE - "Final Episode"
Blu-ray SIX - "The Complete Saga"
Unfortunately, I do not have this disc.